Follow up to the successful boxing game, Punch-Out!! The basic gameplay is identical to the original, but you have all new WVBA boxers to face off against for the coveted champion's belt. 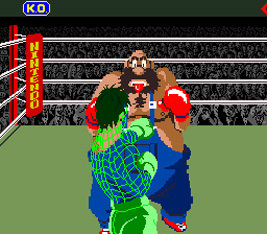 The boxers in this version are bigger and stronger than those in the previous game, but you use similar methods to fight them. Skip left and right to avoid attacks, and punch with a left or right hook (face or gut) to weaken them. Many of the graphics from Punch-Out!! were recycled for this sequel. This included the backgrounds that featured guest appearances by Mario, Luigi, Donkey Kong and Donkey Kong Junior.